For the exact 3D load volume measurement of dump trucks LASE and his Russian distribution partner FEST successfully installed the application LaseTVM-3D for the Russian road construction company Transstroymekhanizatsiya (TSM). 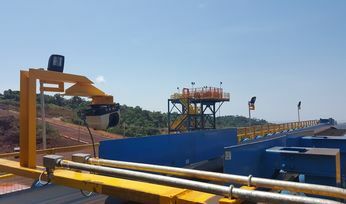 The turnkey system is used to measure raw materials like sand and road metal for the construction of the motorway M4 "Don" in the Voronezh area in South-Western Russia. By the combination of 3D laser scanners, IP-cameras and traffic lights an automated process for the accurate payload measurement is ensured, which prevents load differences. Further features like license plate recognition and load area imaging allows a fully comprehensive and transparent data handling within this set-up. Transstroymekhanizatsiya (short TSM) is one of the main road construction companies in Russia and is charged with the construction of the motorway M-4 near the city of Pavlovsk in the South-West of Russia. For the construction of the route between Moscow and Rostov-on-Don raw materials like sand and road metal are used for the base course of the asphalt, which are purchased by TSM. For the accurate account of the delivered materials an exact payload measurement system for the road dump trucks was demanded for this task. By applying the laser-based application LaseTVM-3D - Truck Volume Measurement the customer receives precise volumes of the delivered materials. 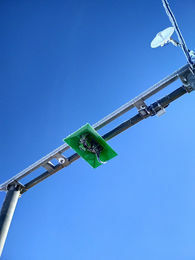 The system is installed by the Russian distribution partner FEST at two checkpoint stations next to the motorway where each one 3D laser scanner from the LASE 3000D-C2-11x Series is mounted on a metal framed truck gate. One checkpoint also uses a combined weight bridge in order to have volume and weight data in one checking procedure. The standard operating process starts with the approaching of a loaded truck under the framed gate with a speed of approx. 5 km/h, where the license ID and a topview image of each incoming truck is recorded already. After reaching a central position under the gate the 3D laser scanner starts the 3D measurement process. Simultaneously the operator checks against the loaded materials within the delivery documents and the camera images. After an average scan time of 10 seconds the initial measurement procedure is finished and the truck can drive for being unloaded. Afterwards the truck returns to the measurement gate for a final emptiness control. 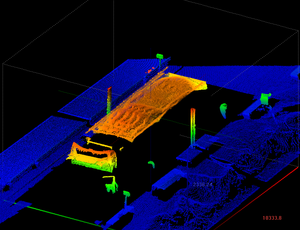 The 3D laser scanner measures the empty load area of the truck and forwards the scan data to the LaseTVM software, which calculates the load volume difference from both measurement data (full vs. empty). Thus the truck ID and a topview image are recorded again and stored in the data base. The laser measurement data are processed to the LaseTVM software and visualized to the operator, who uses a GUI in Russian language with add-ons for statistics, history overview and material library. Two further IP-cameras with integrated IR-lights for day/night mode are installed at the front and back side of the gate in order to recognize the license plates. 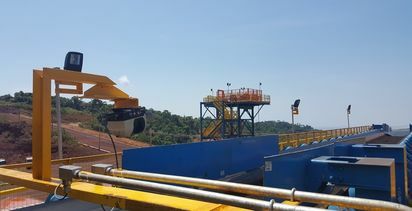 An additional video camera monitors the trucks and displays the loading area and the type of material to the operator. A cover hood protects the 3D laser scanner and the cameras from weather influences. Thus customer TSM is able to monitor all delivered material volumes by specific filter options within the software for a comprehensive and transparent data handling. By the application of the LaseTVM-3D measurement system TSM is having a reliable, tamper-proof control of the delivered material, which provides them and their suppliers a debitable settlement basis without possible manipulations. LASE is one of the worldwide leading companies for laser-based sensor applications for the industry. We offer innovative and productive solutions by combining state-of-the-art laser technology and sophisticated software applications. The broad product range of precise and reliable 1D-, 2D- and 3D laser measurement systems can be applied for several industry sectors. Profiles, positions, dimensions and volumes can be determined exactly. Founded in 1990, our German-based company became a Global Player throughout the years that is internationally represented by branch offices or distributors. A close cooperation with our customers is important for us with a high emphasis on an efficient and successful project implementation. COMPETENCE, CREATIVITY AND PASSION distinguish us!